Heritage, culture and tradition pervade every element of our lives, however, more and more often these days we find that fewer of us remember the old ways. A couple’s wedding day is a key life event that is shrouded in ritual, and while many of the traditions have gone by the wayside, many more are still known and loved today. Here, we look at some of the old fashioned ideas surrounding weddings so you can decide whether or not to incorporate them into your own vintage themed day. Most brides are aware of “something old, something new, something borrowed, something blue” and stick to the tradition on their special day. However, not every bride knows that there was another line in the old verse. It went “and a sixpence in her shoe”. In days gone by, a bride would be given a silver sixpence to put into her shoe so that she and her new husband would enjoy health, wealth and happiness in the years to come. I actually had a sixpence in my shoe on my wedding day. It had been handed down through the generations. My mother had used it, and so had my two aunts and my grandmother. I was proud to remember the tradition and incorporate it in my own wedding. 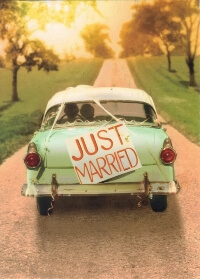 In days gone by, the bride and groom would travel off to their honeymoon straight after their reception in a wedding car decked out with tin cans and a Just Married sign. The bride would have a special outfit for “going away” and she would throw her bouquet just before leaving. This rarely happens these days since most couples stay at their reception until the bitter end, however the bouquet throwing is still a common sight after the wedding. When women used to make their own wedding cake at home instead of arranging for a bought one, they would put charms into the cake. Ribbons would be attached to these tiny trinkets and they would be pulled out of the cake during the “cake pull” ceremony before the bride and groom sliced the cake and served it up. The charms were said to bring good fortune to the person who won it. Wedding cakes aren’t quite the same these days. Many brides and grooms go for something completely unusual like a mound of donuts or a pile of profiteroles! However, in the good old days, it was traditional for the couple to take off the top layer of their wedding cake and save it for a year so they could serve it up on their first wedding anniversary. Some couples would save the top tier of their cake to use as a christening cake for their first born child. In Victorian times, wedding bands in the shape of a snake featuring ruby eyes were extremely popular after Queen Victoria received such a ring from her beloved Prince Albert during their engagement. 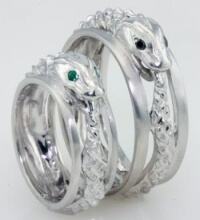 It was believed that the snake’s coiling body would represent eternal love for the couple in their married life together. Many couples these days don’t think twice before meeting up before their ceremony, however traditionally it was believed to be bad luck for the bride and groom to see each other before the wedding. Couples who follow this tradition often report having a much more emotional experience when they see their loved one at the end of the aisle. Brides and grooms at the beginning of the 20th century would customarily marry at high noon and then follow the ceremony with a lunch time reception called a wedding breakfast. In fact, the very name of the “morning suit” got its name from the practice of morning weddings! These days, couples can marry at any time of day, and lots of couples choose an evening ceremony. However, if you want a more traditional affair, a morning wedding is best. These aren’t the only traditions which are starting to fall by the wayside, but they are some of the best known. Why not include some of these in your big day and celebrate your heritage?